We have a limited number of Show T shirts for sale at a special price! They are high quality, double stitched shirts with a silk screen imprint that were made using ten screens! Sizes are Mainly XL with a few L and M. They are preshrunk but may shrink an additional 3 to 5%. (Postage is for Priority Mail for up to 2 Lbs. We can ship about four shirts in a package for $3.20). Add 7.75% CA Sales Tax if applicable. Checks or Visa/MasterCard Credit Cards Accepted. 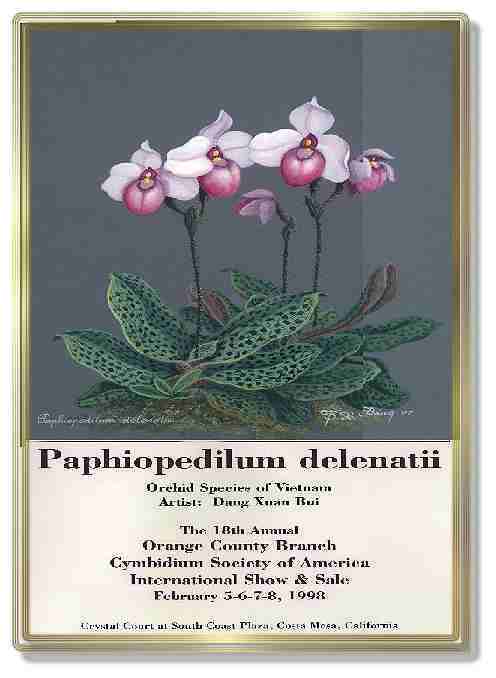 Make check payable to "Fascination of Orchids" and mail to: Fascination of Orchids, 21052 Cocobana Lane, Huntington Beach, CA 92646. You should receive the shirt(s) within two to three days after receipt of check. We have The New 1999 Show pins and a few 1997 and 1998 Show Pins available at $5. Add $.55 postage if ordered alone or no additional postage charge with shirt purchase. We also have Two styles of Show Posters available. They are original art by a professional artist from our Society. They are on high quality poster paper with a heavy U/V coating. #1 Poster is the same delenatii as on the shirt. 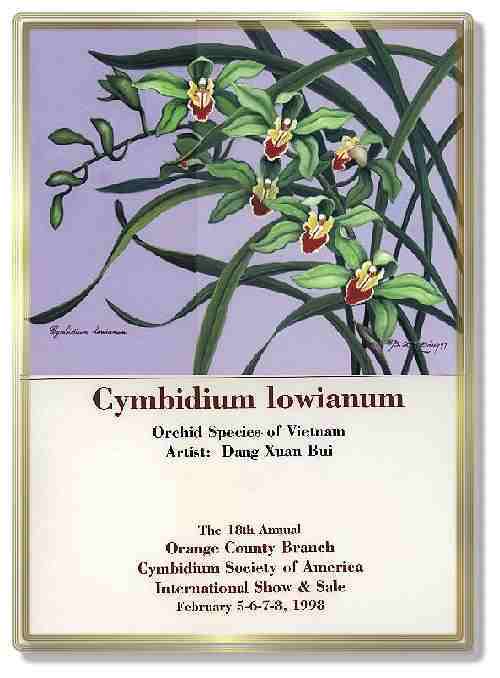 Poster # 2 is a Cymbidium lowianum. The Posters are now only $2.50 each, plus $5 for the Postage and Mailing Tube. We can fit a large number of posters in one Mailing Tube, at no additional charge. We can also put up to two T Shirts and several posters in a large mailing tube for $6, which includes the large Mailing Tube and the Postage.